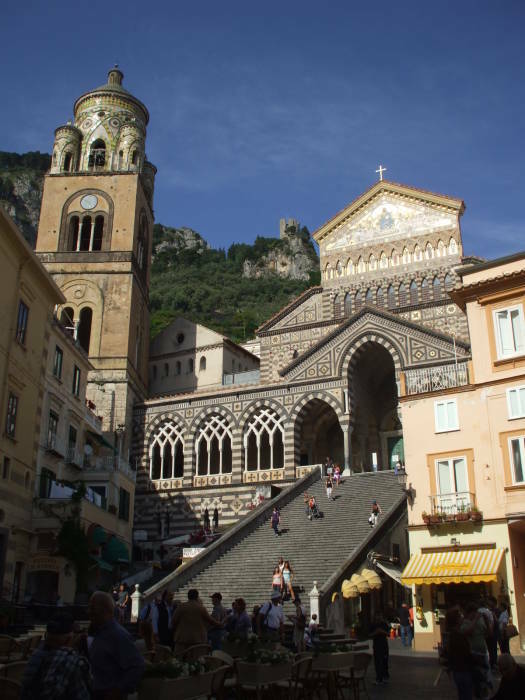 The Cathedral of Saint Andrew is the primary sight along the Amalfi Coast, at least in terms of history. It is also known as the Duomo, the generic Italian term for the principal cathedral in a city. 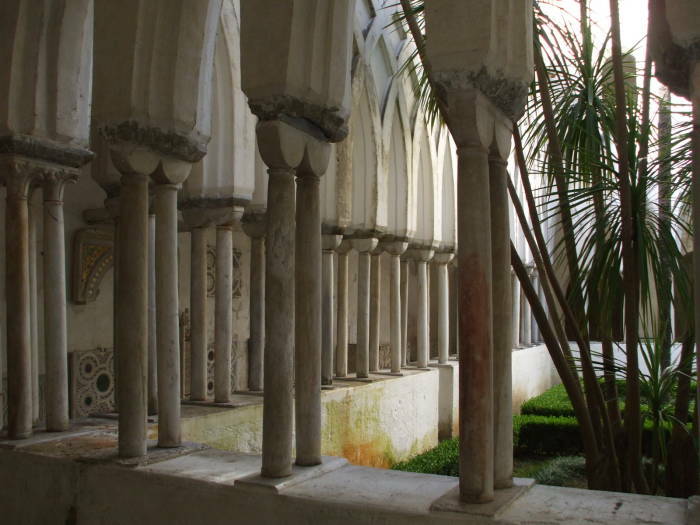 There is a whole complex of buildings here, including il Chiostro del Paradiso or the Cloister of Paradise. It was built in the 1260s, with Islamic-influenced mosaics, Moorish columns, and Greek-influenced Roman sarcophagi. The cathedral complex may seem surprisingly large for what is today a small town with a population of just 5,343 residents. 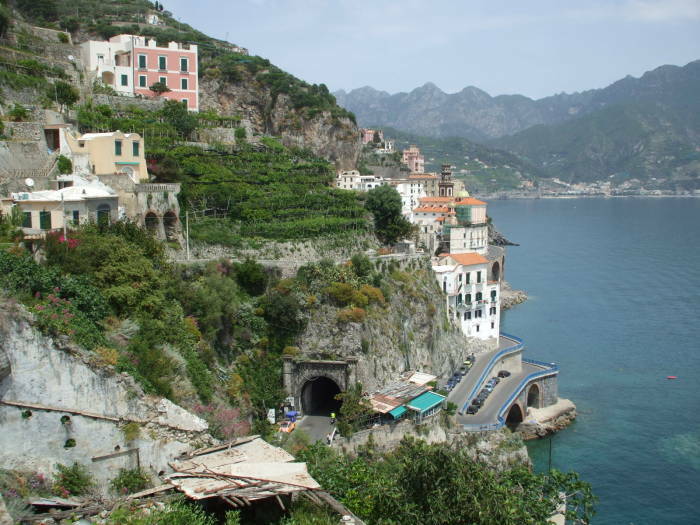 However, Amalfi used to be a major world power and had a population of 70,000. Really! Remember, from the time the Roman Empire dissolved soon after the 300s until the creation of modern state of Italy in 1870, the peninsula of Italy was controlled by a large and fractious set of nations and city-states. Amalfi was one of the most powerful. 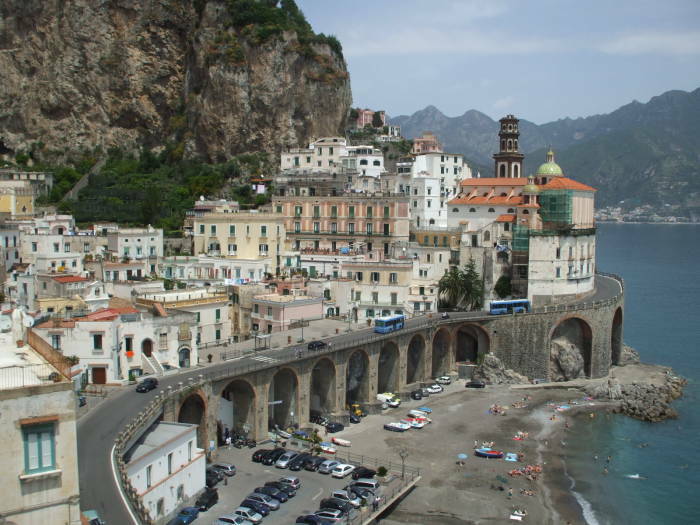 The Maritime Republic of Amalfi started growing in influence soon after the 500s. It was an important Mediterranean trading power from 839 through about 1200. The Tavole Amalfitane or Amalfi Tables were a code of maritime law widely used by European port cities, and it was famous for its schools of law and mathematics. 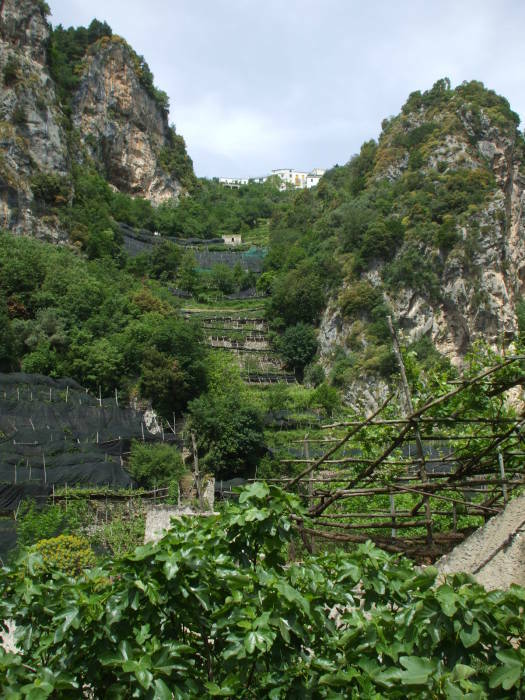 Amalfi traded grain from its neighbors inland in the Italian peninsula, salt from Sardinia, and slaves and timber from the interior. They sold those goods to get gold dinars from Egypt and Syria, used the gold to buy silks from Byzantium, and re-sold the Byzantine silks in western Europe. 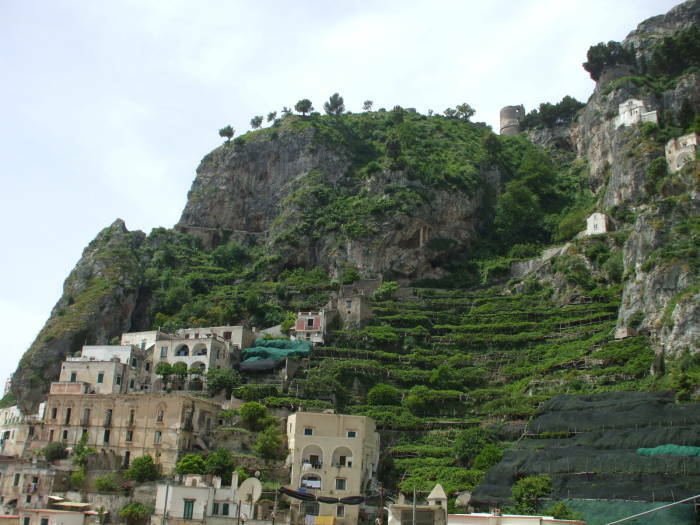 While the merchants of Amalfi were purchasing land with gold coins, the rest of Europe mostly used the barter system. 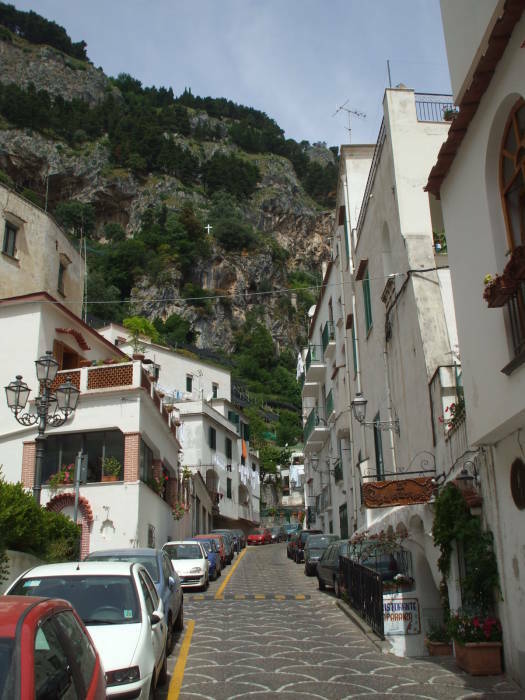 The town, or city, of Amalfi grep to a population of 70,000 by 1000 AD, thirteen times today's population. Then a tsunami in 1343 destroyed the port and lower town. This power and wealth brought, of course, relics. 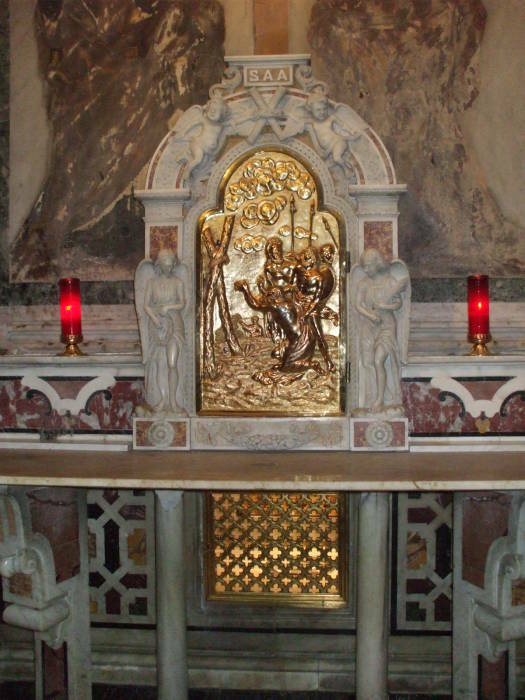 The Basilica of the Crucifix, its original chapel dating from 596 AD, is now the cathedral treasury. The crypt beneath the cathedral itself has "the head and other bones" of Saint Andrew, considered to be Jesus' first disciple. Today, the occipital bone of the skull is kept behind the altar and is only shown on certain occasions. The other bones are hidden under the altar, covered by a heavy slab of marble. A crystal phial is placed on top of the sepulcher, where on the eve of the Saint's holiday or on other occasions, the "Manna" is collected. This is a dense liquid that has always appeared on the Apostle's sepulcher, both in Patras and Constantinople. This event has occurred in Amalfi for 750 years. 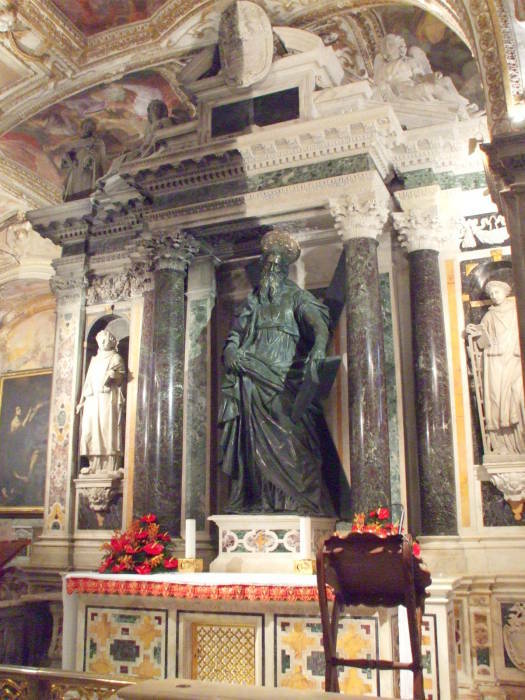 However, Saint Jerome, c. 347—420, wrote that the relics of Saint Andrew were taken from Patras to Constantinople by order of the Roman emperor Constantius II around 357 and deposited in the Church of the Holy Apostles. His shoulder blade is said to be in the monastery of Moni Varlaam in Meteora, Greece. The local legend back in Patras says that his relics were sold to the Romans. His head (this being the second one) was one of the Vatican treasures, given by the Byzantine despot Thomas Palaeologus to Pope Pius II in 1461. This and other Andreian relics are now in one of the four massive piers supporting the main dome of Saint Peter's Basilica at the Vatican. In 1964 Pope Paul VI gave some of his relics (a small finger, part of the top of his cranium) to Patras. Other bodily relics of Andrew are said to be in Saint Mary's Cathedral in Edinburgh, and the Church of Saint Andrew and Saint Albert in Warszawa. There are Georgian traditions that he was the first preacher of Christianity in Georgia, and similar ones in Romania and Ukraine. Various legends state that the relics of Andrew were carried under supernatural guidance from Constantinople to the current Scottish town of Saint Andrews. The first picture from the crypt beneath the cathedral shows the altar in the crypt with a statue of Andrew standing in front of his X-shaped cross. The second picture looks into the rear of the altar and into the reliquarium. 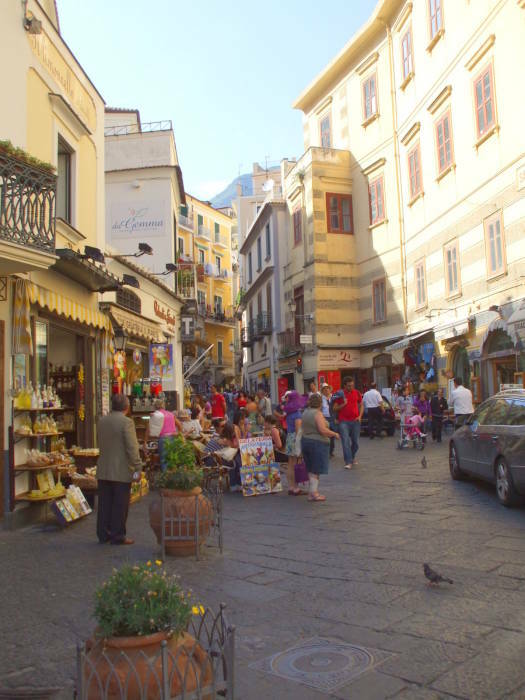 The main square of Amalfi, at the base of the large staircase up to the cathedral, is Tourist Central and a beehive of souvenir shops. There is a very distinct boundary about 150 meters beyond the gateway from the coast road into the main piazza. Below that line all is tourism: little bottles of limoncello, tea-towels with recipes for making your own limoncello, ceramics and postcards, and — of course — bags of dried plants labeled in English as "HERBAL VIAGRA". The Package Tourist is the Impotent Tourist, an unseemly phenomenon I have also observed in Mexico. Above that boundary line is where actual Italians live. There are stores where they buy their groceries and clothing, shops where they get their televisions repaired, schools where their children are educated, and so on. That part of Amalfi is far more interesting. 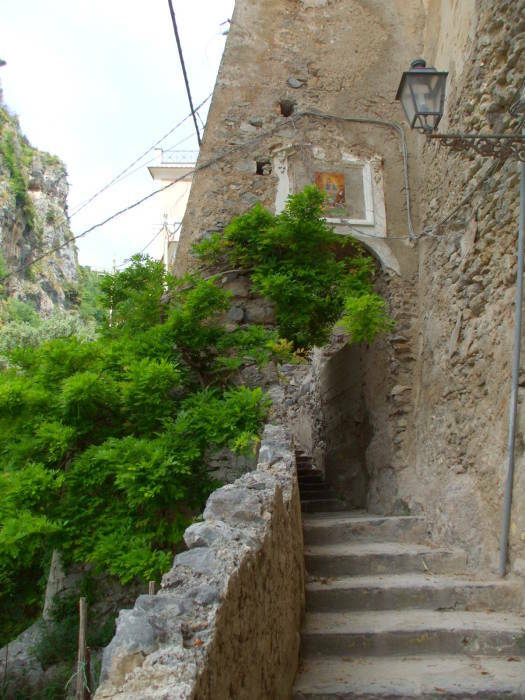 Via dei Dogi, the main street of Atrani, leads inland and uphill from Piazza Umberto. It doesn't connect into the road network leading inland into the central ridgeline of Peninsola Sorrentina, at least not in a form that could be used by automobiles. Scooters could follow some foot paths and get to the inland roads. To drive a car inland, you would have to take the coast road around the next point and turn onto a steeply climbing road. 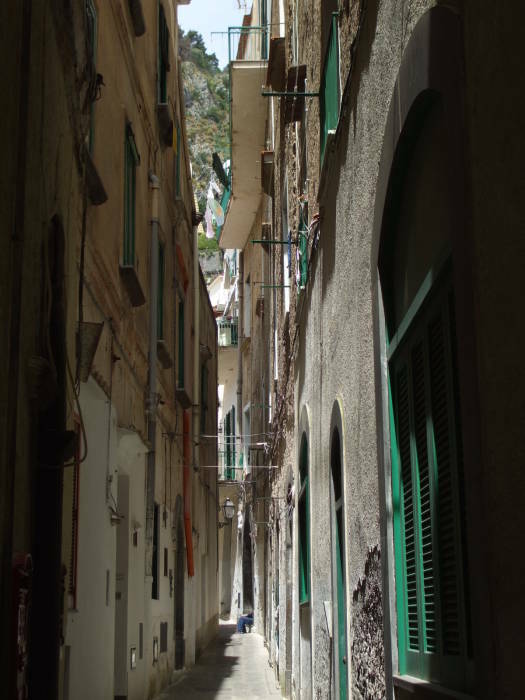 A few short lanes branch off Via dei Dogi, most of them just access lanes for homes or businesses. 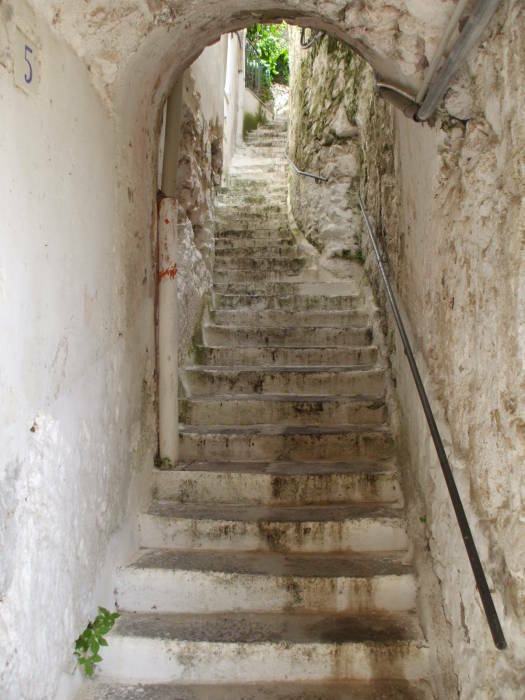 Much of what might appear as streets on a map of Atrani are really pedestrian passageways, some of them completely covered over and some of them narrow staircases, like something from the Greek islands. The rugged terrain of the peninsula must be awfully difficult to cultivate, but it is valuable agricultural land. The steep slopes are carefully terraced and planted in a mix of citrus trees and vegetables. The local variety of lemons are long, typically at least twice the usual size and with a thick and wrinkled skin. Meanwhile the path inland leads up steeper and steeper. Before long you have climbed higher than you realized. The terrain quickly rises to an elevation of 300 meters. Towns closer to the central ridge of the peninsular are at 500 to 600 meters, and the peaks are at 1,000 to 1,300 meters. 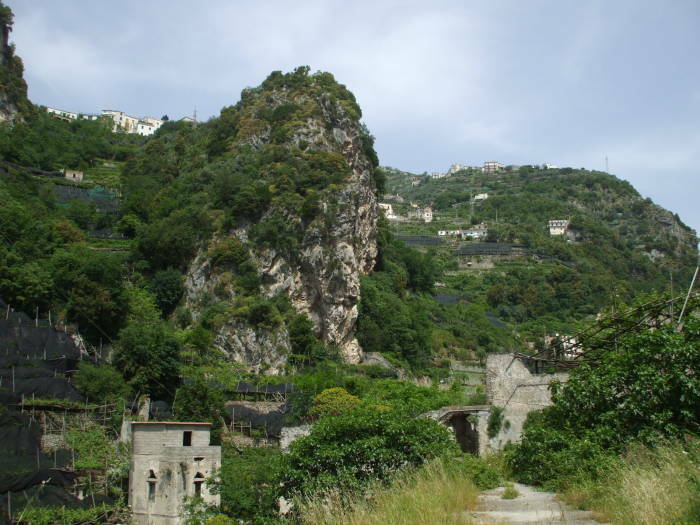 Monte Cerreto, the main peak back the ravines behind Atrani and Amalfi, reaches 1,315 meters. Eventually you turn around and start back down. 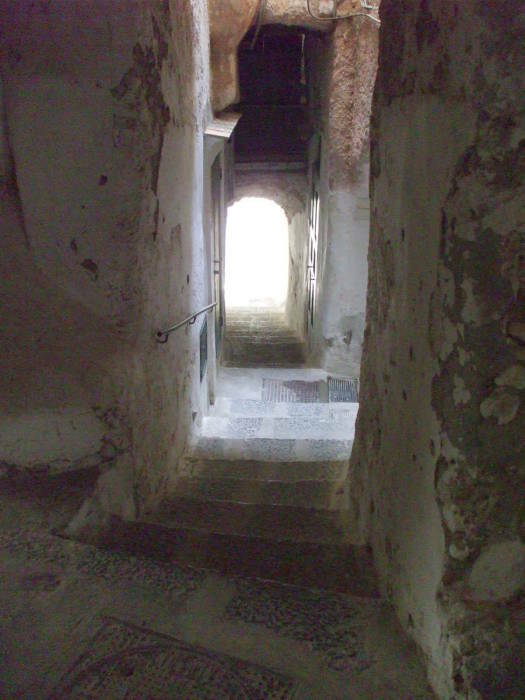 The path down into the town of Atrani eventually leads into enclosed passageways and staircases. 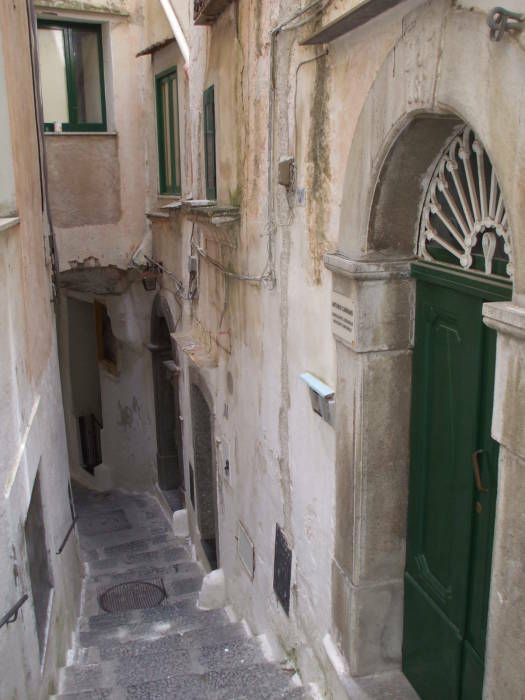 These passageways lead further and further back down to the center of Atrani. 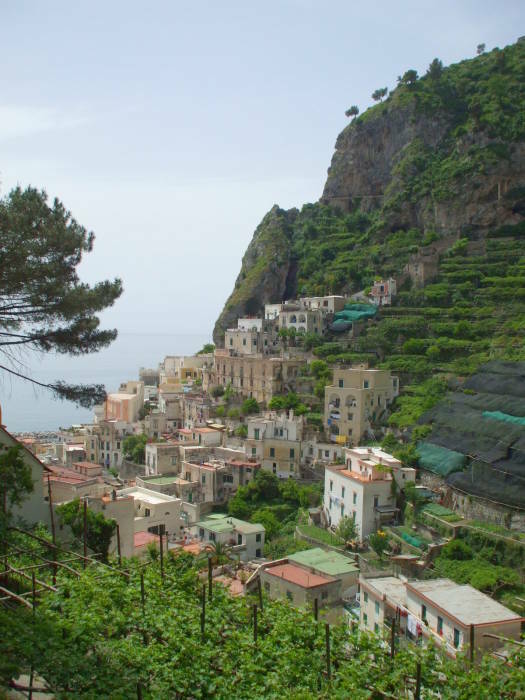 These pictures show another walk — instead of walking along the coast road and around the point, what about "cutting the corner" by climbing up and across the steep ridgeline running down to that point and then dropping down into Amalfi? The path quickly leads us several tens of meters above the level of the coast road. As we continue upward and toward the point, we can look back and down on the tunnel entrance. Now let's travel to some other coast towns!